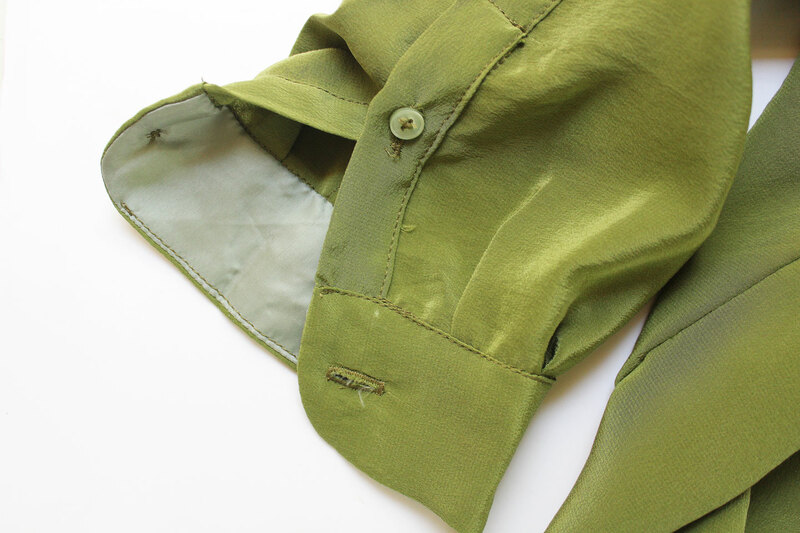 There’s something about a button up shirt sewn in silky fabric that really adds a touch of femininity. My second Melilot will be a great new staple for my fall wardrobe. Ok, so I got the fun & quirky vibe nailed with last weeks giraffe print Melilot. 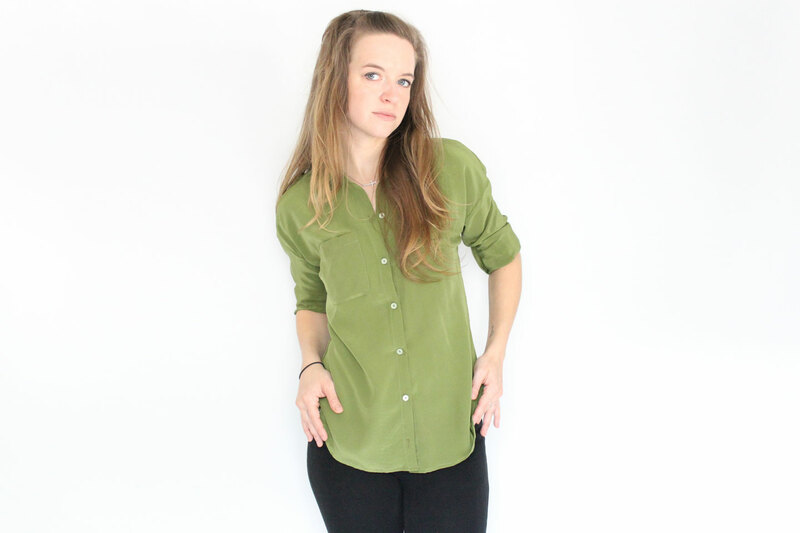 But I wanted to try this top in both views, so I opted for a solid color with the long sleeve version. 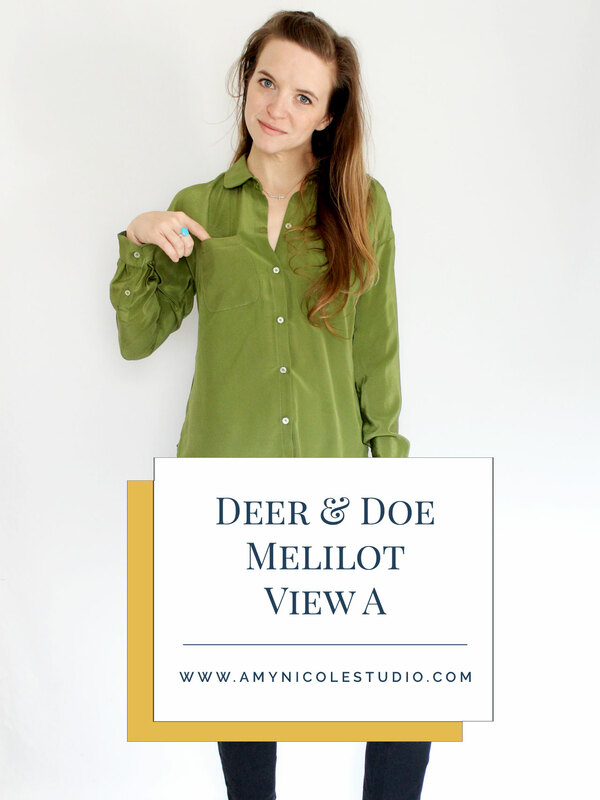 The pattern as you know is the Deer & Doe Melilot. Which is quickly becoming a new favorite of mine. I wouldn’t say it replaces the Archer, because I think the two have very distinct differences. Where the Archer is a more classic, menswear type fit. The Melilot is a more feminine and trendy shape. I wouldn’t sew this up in a crisp fabric, it screams to be made up in something light and draped. 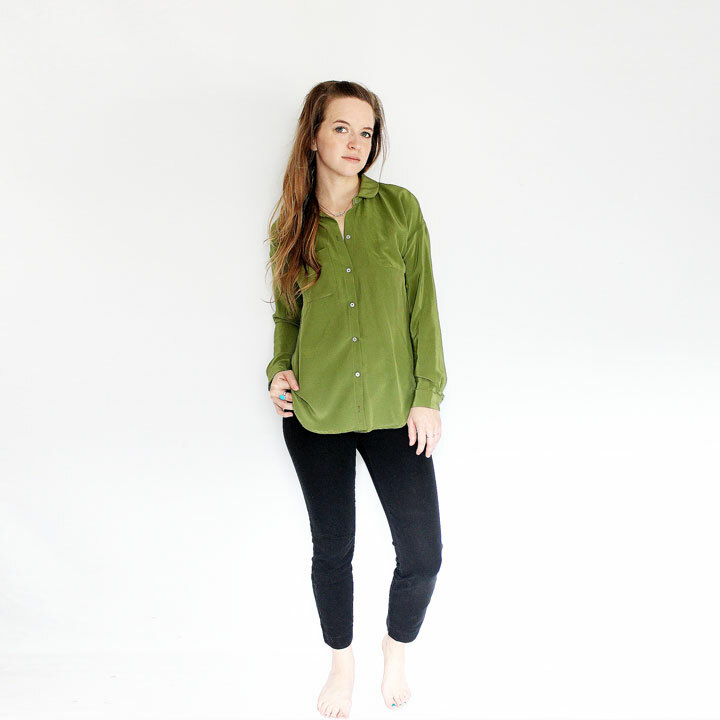 This green crepe de chine has been in my stash forever! I got it when I was still studying in FIT, for one of my first ever classes in draping (because, hello it drapes beautifully!) I ended up using the base of my project in that class to make this dress that I sadly no longer wear because it has an unfortunate stain right on the chest that I can’t get out. I’ve had plenty left but I just couldn’t decide what to do with it. I’m so glad I saved it because I think it looks amazing in this pattern (and feels amazing too!) I love love love the richness of this mossy-green color. 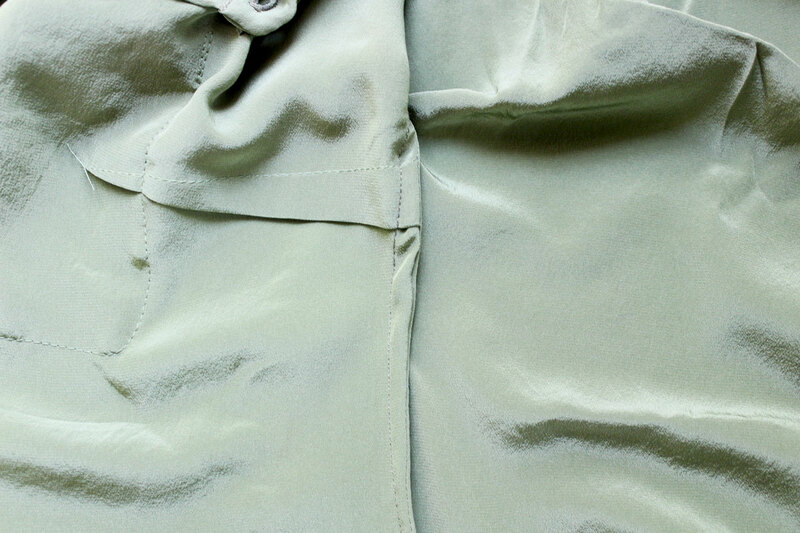 For this version, I decided to do the open placket for a more traditional look. 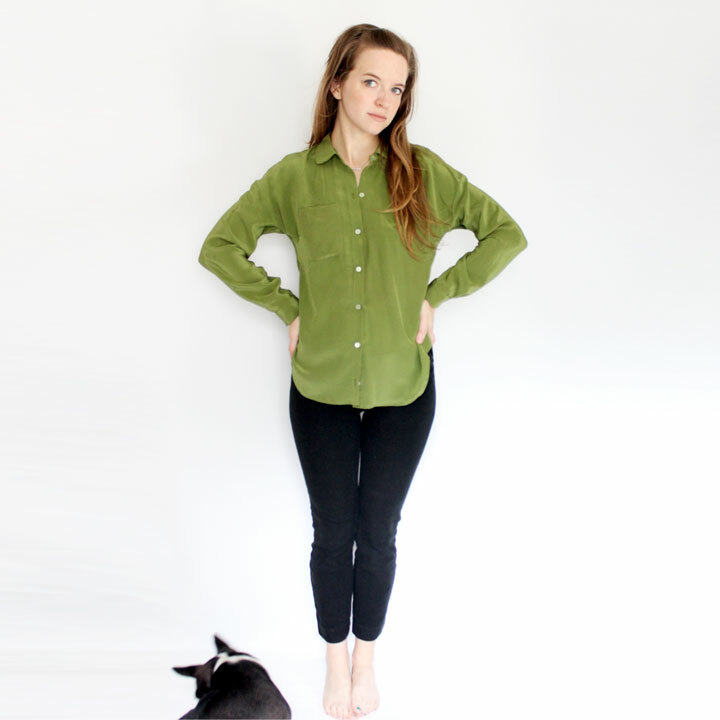 The hidden placket I think is great for prints, which is why I chose it for my giraffe top. I also did the single breast pocket instead of both sides. A lot of these decisions stemmed from the fact that I just BARELY had enough fabric to squeeze this out. I even had to cut my cuff lining in a contrast fabric because I didn’t have enough (which can be a fun little detail if you are ever in a bind). 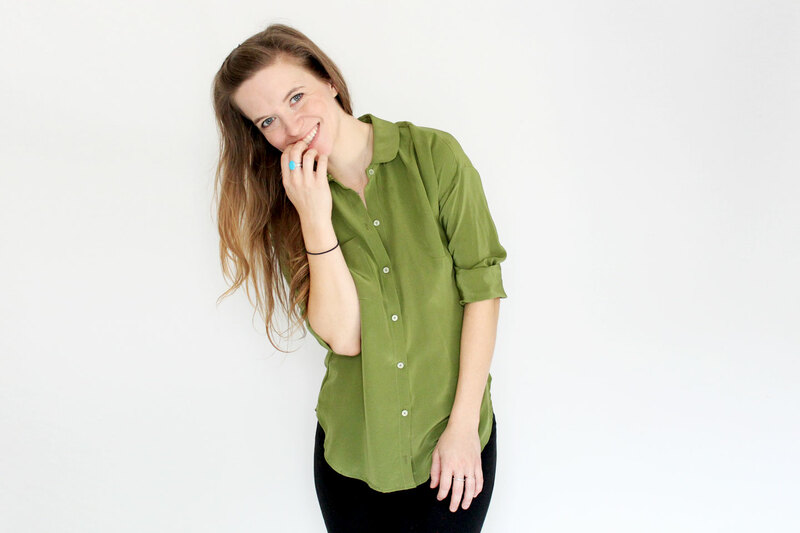 I kept the peter pan collar because … duh. This fabric was just so beautiful I had to do french seams to keep it nice. I didn’t make any adjustments to the fit of this top and it fits perfectly. I cut a size 34 (I think – whatever the smallest size is). Typically on a top like this I will have to shorten the sleeves or take in some off the side seams but its absolutely perfect. Sew it again? This is definitely going into the go-to arsenal. SEE IT IN ACTION on my youtube channel here. And while your there… subscribe! 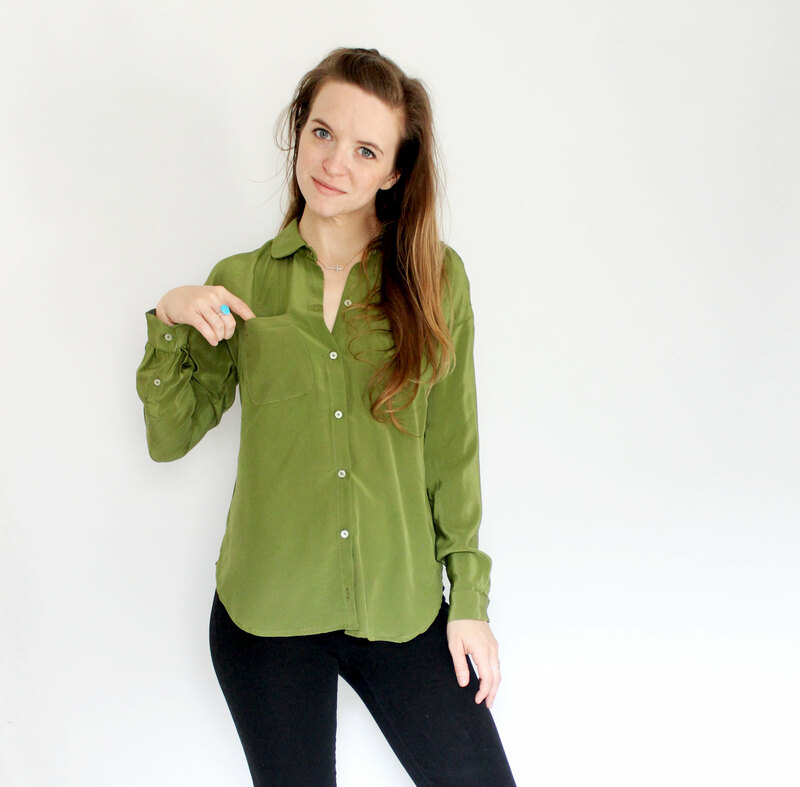 For my own wardrobe, I’m using lots of lovely rayon challis to make tailored tops to get that same look. And you pull off that spring green shade SO well. Great make! Thanks so much Julia! I lOVE rayon challis – my other Melilot (the giraffe print) was sewn up in that and its a dream!